When it comes to bunker renovations, the bunker liner product shall be CAPILLARY CONCRETE, a patented product, which is a specially formulated mixture of acceptably sized aggregate, various proprietary additives and water that must be uniformly mixed in a concrete mixer before installation. 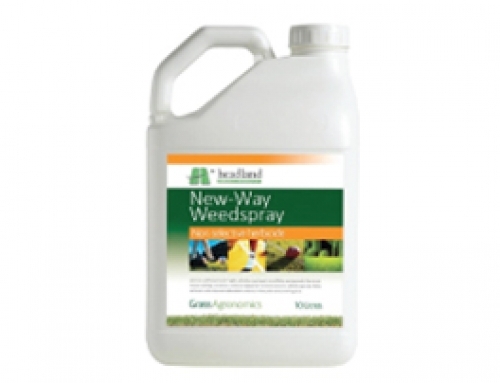 This creates a homogenously blended mixture that is poured from the mixer into heavy-duty utility vehicles, transported to the bunker and placed inside the bunker at a minimum depth of 2 inches (5 cm). The surface of the product is compacted with a roller and covered in plastic for a minimum of 24 hours to allow for adequate curing before sand is placed on top of the product. The result is a strong, homogenous and uniformly bonded product that allows water to drain through it at hundreds of inches per hour to prevent erosion and reduce contamination of bunker sand. For added protection and peace of mind, Capillary Concrete offers a 10-year guarantee. The first five years are completely covered under our INSURED FINANCIAL GUARANTEE (IFG) POLICY provided by Lloyds of London insurance syndicate. 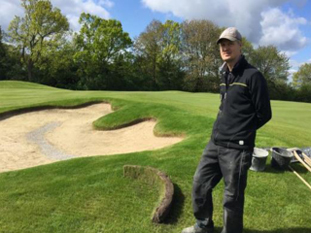 This policy covers each bunker individually and protects the club, contractor and architect from failure for a period of 5 years. At the end of this 5-year term, the club can, at its option, purchase an additional 5 years of coverage, or do nothing and continue with an additional 5 years of our prorated product warranty. Prior to installation of CAPILLARY CONCRETE, the CONTRACTOR, or OWNERS REPRESENTATIVE, or SUPERINTENDENT shall confirm that the perimeter area around the bunker does not channel excessive water into the bunker area, the bunker subgrade is positively pitched, stable under foot, smooth, compacted, free of debris and meets the ARCHITECTS design specifications. It must also be ensured that all bunker trenches have been excavated and constructed to specifications and drainage pipes and bedding gravel have been installed to the ARCHITECTS drainage specifications as dictated by site conditions. After installation, it must also be confirmed that the drainage system is functioning properly before installation of Capillary Concrete. It is recommended that a tracer wire be installed in all drainage trenches. To maintain the pervious nature of the product, every effort should be made to prevent soil contamination of CAPILLARY CONCRETE during installation, curing, and prior to sand installation. Grassing around the perimeter of the bunker should take place prior to and be secured to the soil by roots or staples before the installation of CAPILLARY CONCRETE. 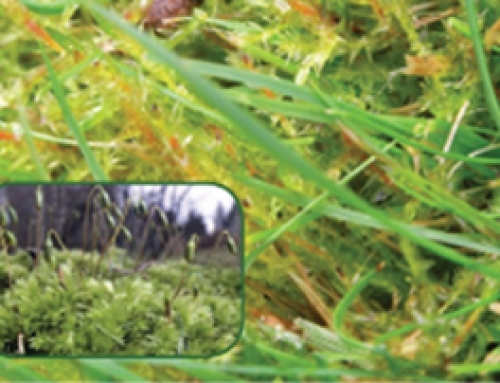 In situations where grass cannot be installed prior to installation of Capillary Concrete, extreme care must be used to prevent soil contamination. In these situations the plastic must remain on the product until sand is installed. 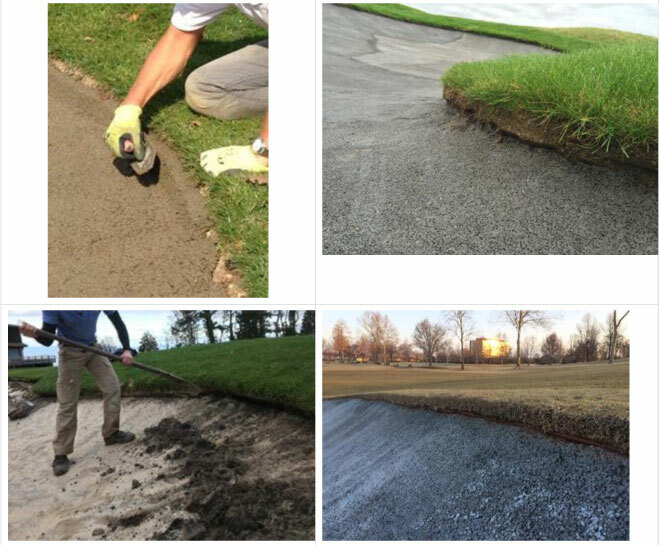 It is also recommended that when installing the sand in the bunker, an extra 4 inches of sand approximately one foot wide be placed on top of the Capillary Concrete around the perimeter of the bunker to reduce soil contamination as the sod is either installed or irrigated to establish rooting. If necessary, this extra amount of potentially contaminated sand can be removed prior to opening the bunker for play. (See Typical Installation Specification Drawing for details). Certain installation requirements must be met and documented before the insurance company can approve and activate the policy. Those documents are part of this specification sheet but will also be sent separately via email for signing by the Owners Representative. Preserving the desired style or motif and reducing ongoing maintenance is critical to the success of any bunker restoration/renovation plan. Sometimes the topography causes bunkers to be located where large amounts of water sheet-drain into the bunker from the outside. This requires some extra thought to the edge design at these exposed areas. The strength of Capillary Concrete allows the opportunity to protect the inside wall of the bunker better than any other product. 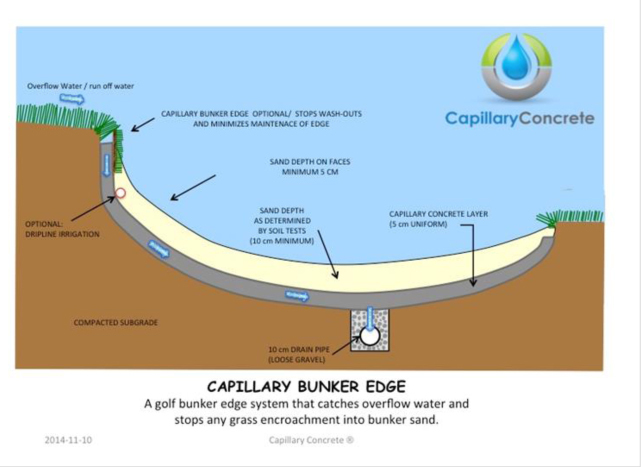 Capillary Concrete has the ability to be shaped almost vertically at installation to get the least possible amount of soil in contact with the bunker sand. In this case, either the existing soil and grass, or sod is utilized as the edge of the bunker. The 2-inch (50mm) layer of Capillary Concrete meets the edge of the bunker. Rolling the sod over the face to cover the soil is an option. Another option that has been effective is stabilizing the perimeter of the bunker edge by using thick sod pieces laid with grass facing the inside edge of the bunker. 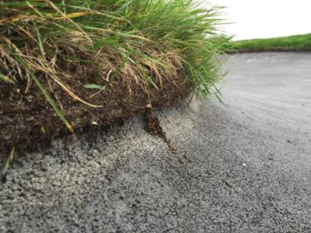 The roots and thatch help to stabilize the edge and help keep the edge from collapsing. Place the sod pieces along the inside edge (grass side in), like in this picture, before installing the Capillary Concrete layer. On steeper greenside slopes, it is recommended that a notch approximately 2” (5 cm) deep and 2” (5 cm) wide be installed around the perimeter of the bunker where the vertical lip meets the floor of the bunker to create a “footer” to support the structure. (please ask us for detailed drawings as needed or desired). Here, a vertical edge is created with a trowel, and carefully compacted on all sides. If the surrounding grass is utilized, we recommend undercutting the lip with a shovel to create a nice finish. If not, then make sure a fresh piece of sod is laid on top to cover the top finished edge of the Capillary Concrete. If the bunker, or part of the bunker, is exposed to large amounts of water that sheet drains into the sand, an artificial inside edge glued to the Capillary Concrete may be the solution. In this case, a small interceptor trench between the artificial turf and the natural turf is created to allow water to flow into the vertical Capillary Concrete layer and be transported to the subsurface drainage system. This solution is also very maintenance friendly and requires minimum edging to keep the edge clean. Different materials are available to create the desired look to the inside edge, from a green/brown artificial turf to natural coconut fiber, etc. 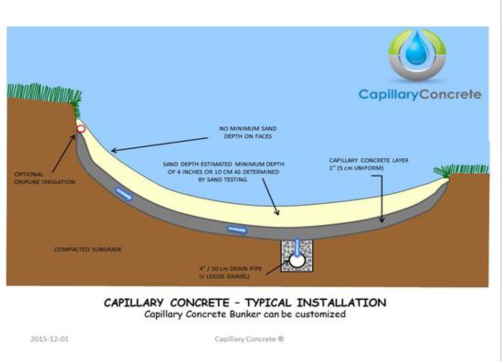 Please contact a Capillary Concrete representative for more information on your options. When uncovered, Capillary Concrete allows water to drain at hundreds of inches per hour. Once sand is placed on top of the product, the new water drainage limit will be the Ksat (saturated hydraulic conductivity) of the sand that covers the Capillary Concrete product. After gravitational water has freely drained from the sand, a certain amount of water will always be retained against the force of gravity. This is known as capillary water. Each sand will have a different amount of capillary water retention based on its particle shape and size. 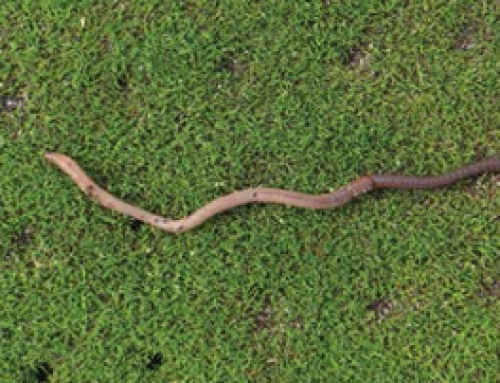 This capillary water retention can have an effect on playability and also help you determine how much sand is required in your bunkers to achieve desired playability based on the amount of moisture retained in the sand you select. 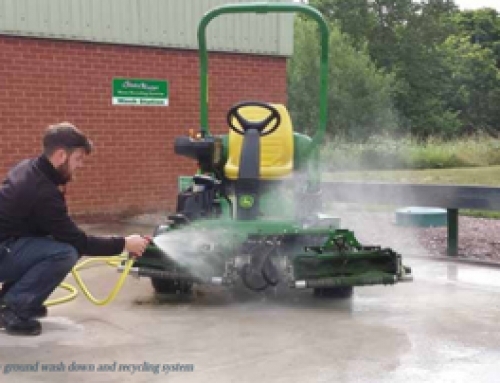 Sand particle size, color, shape, compaction rating, drainage characteristics, are subjective and exclusive to each project based on budget and desired playability at that particular golf course. 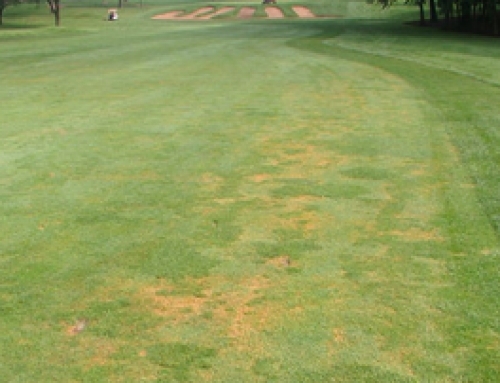 As a result, Capillary Concrete cannot make bunker sand recommendations. However, we do recommend that the bunker sand that is ultimately selected falls within the USGA recommended bunker sand guidelines and that it bridges with the selected gravel to reduce migration of finer particles into the Capillary Concrete layer. Capillary Concrete works with the testing lab, (Turf and Soil Diagnostics) to perform a Capillary Wicking Test to determine how high in the sand column water is held against the force of gravity. A 24-hour sand dry down test is also performed to show how fast the sand surface will dry. These tests will help you determine the depth of sand that provides the best playing conditions for your course. In North America, the mix will most likely be delivered to the golf course in a ready mix truck with all additives homogenously mixed and ready for installation after a few simple steps. Before the project begins, Capillary Concrete’s Product Manager will contract with a local ready mix supplier to formulate a Custom Mix Design specifically for this project using an acceptably sized aggregate with adequate void content and dry rodded unit weight that falls within the standards accepted by the USGA for drainage and greens construction. This gradation should also be compatible with the selected bunker sand. In Europe and others parts of the world, we will likely use a tractor mounted PTO driven mixer to blend the aggregate with bags of our Capillary Concrete Admixture and water. A custom mix design will be formulated for your project based on the aggregate used. Please ask for additional information regarding the mix design. Please click here for Bunker Renovations Pre-Construction Checklist and Installation Instructions.